HERE'S a first look at the styling of Honda's next-generation CBR125R, spied on the updated Asian-market 150cc version of the model. 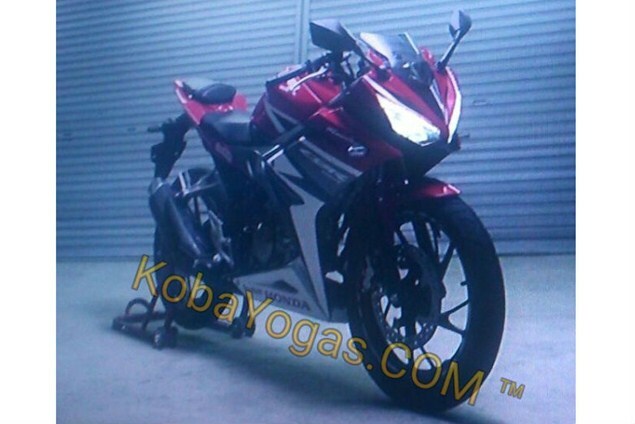 The pictures are from Indonesian blog Kobayogas.com and appear to be still images taken from a video. They show the revised model has adopted a twin-light face to bring it into line with the CBR300R, CBR500R and Fireblade. The bike also has completely new bodywork from nose to tail, adopting a lighter, sportier look. While it’s hard to make out details of the frame or engine, it’s believed to have benefited from few technical updates while carrying over the chassis and single-cylinder, water-cooled engine. The seat is more raked, with the pillion making do with a small pad raised several inches higher than the rider’s seat. New, alloy pillion peg hangers are also clear to see, suggesting there’s a revised sub-frame underneath the reshaped tail. At the front, the current bike’s styling – itself near-identical to the previous-generation CBR250R – has been replaced with a slimmer, lower look. The new model’s screen is little more than a token gesture, barely reaching higher than the tops of the bars. Weather and wind protection is clearly not on the agenda.